Moroccan food is an assault on the senses, in a good way. Spicy, full-flavoured and often boasting a mix of contrasting textures and ingredients, the multiple layers of flavour and aroma make every meal an intoxicating affair. 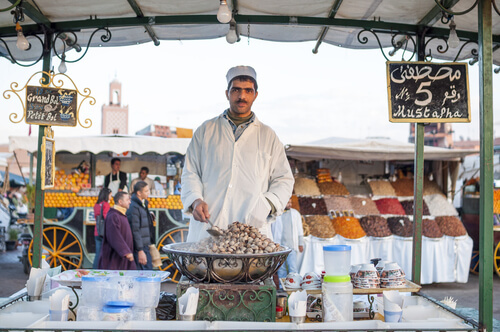 Morocco’s Berber roots and strong Arabic influence is reflected in its cuisine. Olive, figs and dates feature heavily in lamb-based stews and couscous, a staple, is spiced with cumin (also used for its digestive benefits), paprika, coriander, mint, orange and lemons. The result? Spicy, flavourful meats and veggies, and an array of dense, rich sweets that’ll leave you dreaming of Morocco long after you return home. Similar to peanut butter, this chunky dip made with roasted almonds, argan oil and honey and is commonly eaten at breakfast. While alcohol isn’t as readily available as it is in non-Muslim countries, Morocco is not a dry country. Moroccans make their own beer and local brands include Casablanca, Flag Special and Stork. This street food favourite of spiced ground meat with almonds and sesame seeds, coated in orange blossom water can be found in the medina and makes for a great mid-shopping snack. A rich soup of broad beans, it’s served for breakfast with a sprinkling of cumin and some olive oil with freshly-baked bread. Another Moroccan favourite that's sold in the medina, this flower-shaped cookie is deep fried, then covered in honey and sesame seeds. It's a sticky mess, but one worth getting your hands dirty for. A combination of herbs (cilantro, coriander, parsley) and spices (cumin, cayenne, saffron), this marinade is often used with fish and meat before it’s grilled over hot coals. It’s also served as a dipping sauce. Best eaten on a Friday when locals typically eat it, couscous is a meal on its own. Steamed semolina grains are cooked with vegetables and meat and arranged on a platter to be eaten with spoons. A particular one to try is the seven vegetable couscous considered particularly auspicious (seven is a lucky number in Morocco) and normally eaten on a holy day. A rich soup of tomato, lentils, chickpeas and lamb with a squeeze of lemon and coriander, this is a common breakfast dish andis served with a chebakkiya. You’ll see this basic Moroccan style white bread sold everywhere. Typically baked in communal wood fire ovens, its round, flat shape has a slightly coarse texture and is served with almost every meal. This deep-fried potato cake is a popular mid-day snack. Have it on its own or as part of a sandwich with some harissa for a carb boost. Slow cooked meats are a norm in Morocco but this dish carries a particular significance. Traditionally served at the start of a feast, the host takes (with his right hand) pieces of grilled meat to offer to guests. Hence the lamb, seasoned with salt and cumin, has to be slow-roasted in an underground oven until the meat falls off the bones. Locals will refer to this as Berber whiskey. Powdered green tea made with fresh mint and sweetened with sugar, you’ll have more than a few cups during your visit. It’s commonly served as a welcome drink and with meals but is made from scratch so don’t expect it to appear instantly. Your patience will be rewarded with an elaborate presentation involving glasses with a gold inlay and a ceremonial method of pouring designed to aerate and cool the tea. Different from how the French eat snails, Moroccan snail soup sees the shelled gastropod cooked in a broth made with 15 different herbs and spices (for example, thyme, aniseed, cumin, liquorice). Locals believe the broth is good for digestion and fever. There’s nothing quite like a tall glass of orange juice to cool down. Sold everywhere, just choose any vendor in the market and, for a few dirhams, they’ll happily hand over a glass of fresh orange goodness. 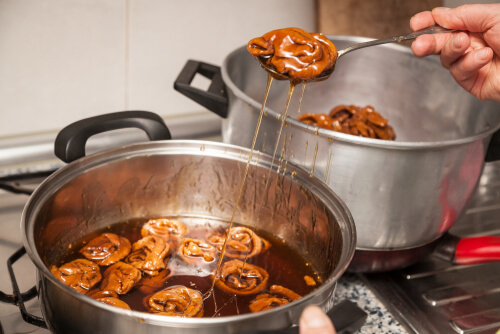 What was once a savoury sweet dish served at weddings and special occasions has become a street food highlight. Originally from Fes, flaky pastry is stuffed with pigeon meat and almonds and flavoured with saffron and cinnamon. There’s also a seafood version with calamari, fish shrimp and noodles. Morocco is the largest canned sardine exporter globally so it’s no surprise that you’ll have a sardine meal at least once. 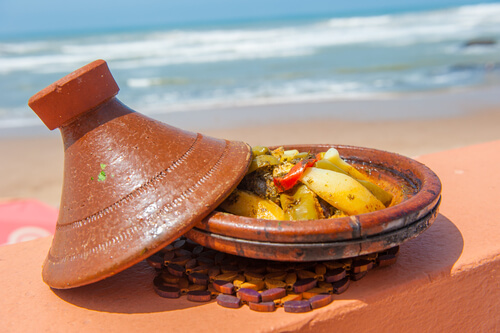 Best eaten freshly grilled at the fish market of Essaouira, there’s also fish-based tajines to try or, enjoy them fast food style in a kefta sandwich of sardines cooked with a spicy chermoula sauce. A sweet vermicelli and couscous dish where almonds, powdered sugar and cinnamon are mixed with meat (chicken, lamb or beef) and steamed. You’ll recognise it from its unusual dome structure. Think of these as Moroccan-style donuts which are hand-shaped and fried on the spot. If you like them a little crispier, ask the vendor to return it for a second round of frying. Eat plain, or dusted with sugar. A dish that won’t be for everyone, the sheep’s head is steamed with cumin, salt and chilli. The ‘best’ bits are the cheek and tongue. It’s a given that you’ll have a few tagines while in Morocco. A slow-cooked stew prepared in a dome-shaped ceramic pot, there are many different combinations of meat and vegetables doused with cumin, turmeric and saffron. A hard one to pass up is the kefta tagine with meatballs cooked in a tomato and onion sauce and a couple of eggs cracked on top. The tagine’s dome shape isn’t just decorative, either. It helps to trap steam and return the liquid to the pot so a minimal amount of water is needed to cook food. A common side dish made with eggplants, tomatoes, garlic, olive oil and spices like cumin and chilli, it is typically served with bread.